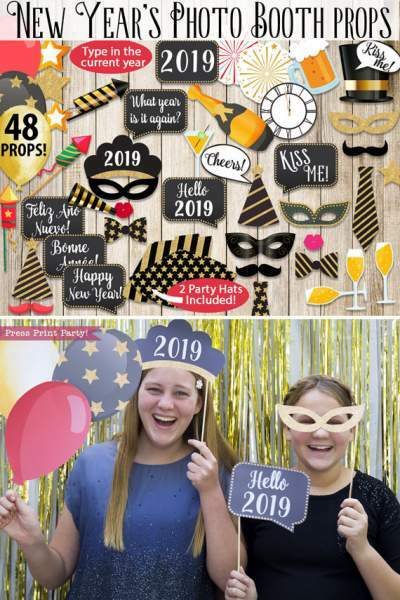 48 New Year's Eve Photo Booth Props Printables - Press Print Party! What!?! Is the year truly almost over? 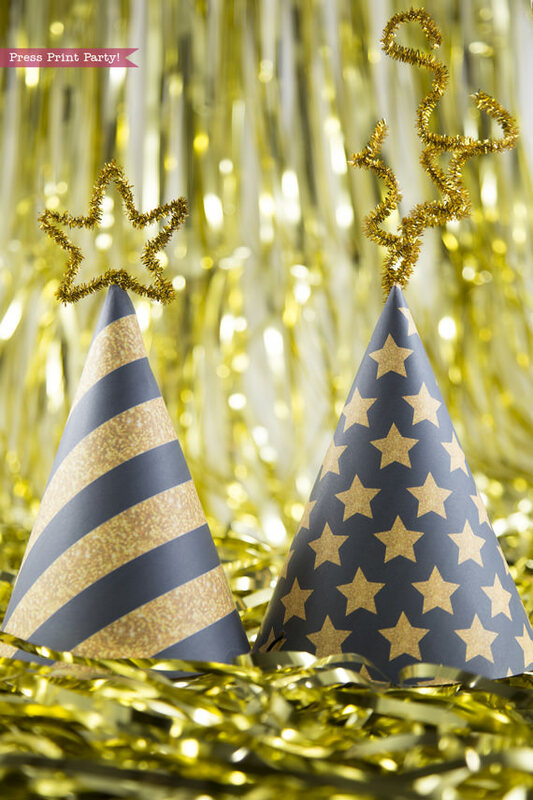 It’s time to plan for an explosive New Year’s Eve party! 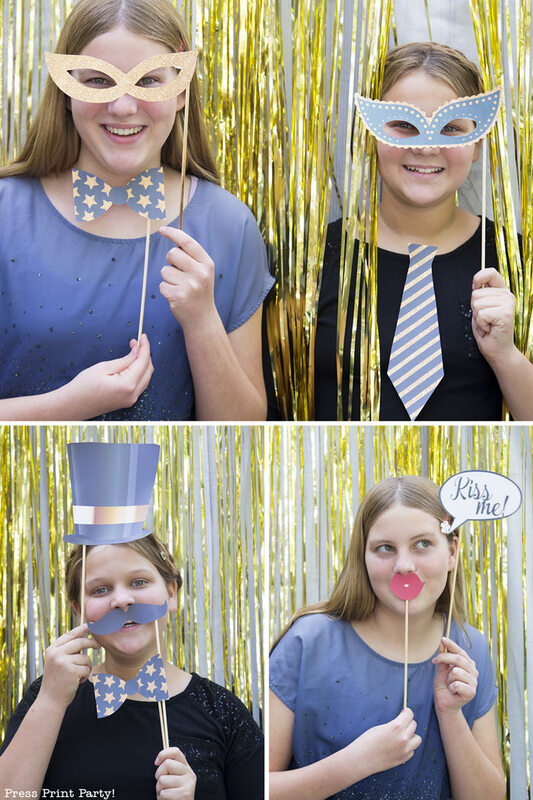 And having photo booth props is a great idea to keep things light and fun. And mostly to keep your guests occupied and awake for the big clock strike at midnight. Golds and blacks are all the rage on New Year’s Eve. So an easy backdrop of gold curtains is sure to attract attention. 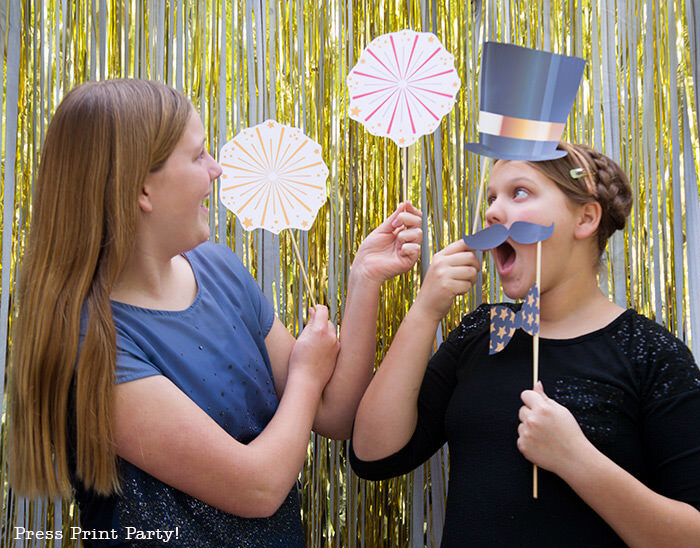 Make sure your photo booth area is well lit for fabulous photos. If you don’t have a set of cheap photo lights (who does?! Well me, but I use them for business), getting a couple of daylight bulbs to put in regular lamps would truly help with the quality of the photos. In this New Year’s props package you get 48 props in all! All the props with the year on them are EDITABLE! That’s right! You don’t have to buy new props year after year! Just change the year and re-print! You also get lots of speech bubbles, like “Kiss me” and “What year is it anyways?”, and even “Happy New Year” in French and Spanish! 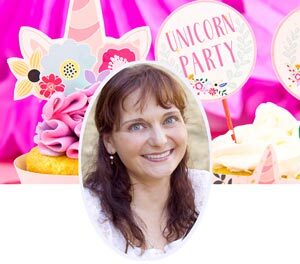 With balloons, mustaches, masks, hats, a bottle of champagne and even the fancy glasses you have all the photo props you need to ensure hours of fun. 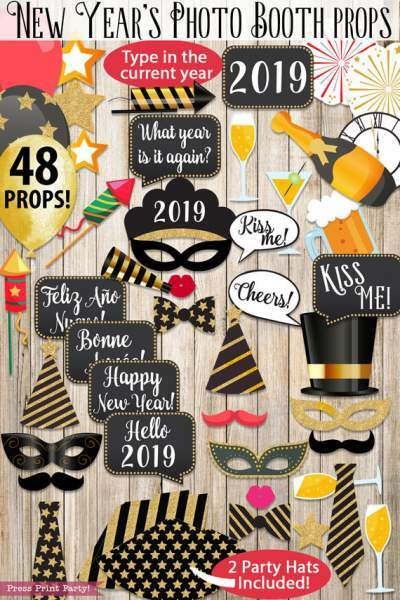 You can check out the full list of what’s inside the file on the New Year’s Props Printable package description page, or check out this video that shows you all the pages. Did you see? The package also includes 2 actual party hats. 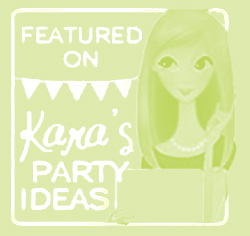 You can have fun with the party hats and add golden pipe cleaners or even a gold tissue paper tassel on the top. Once you buy and download your file, just print the pages you need on white cardstock and cut. Scissors work great and honestly are faster than a cutting machine in this case. Which is why I didn’t include the SVG files. You may need an Xacto knife for the eye opening of the masks. Once the props are cut, just tape a wooden BBQ skewers to the back. Regular tape or packaging tape works great. I usually tape the pointy end to the prop so no-one accidentally gets poked. If you have a left over piece of styrofoam, put it inside a basket and poke the props into it. You’ll look like pro! Get it now and start the fun! ok, totally need to download these!! So fun! 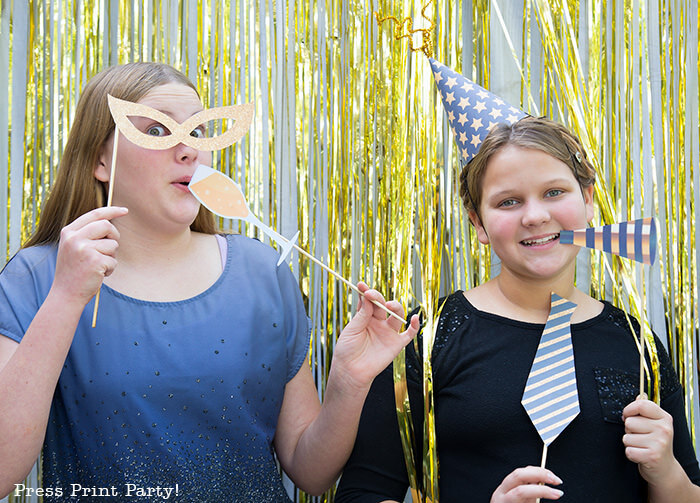 We will end up having some kiddos for our New Years party – this might be a fun way to get them involved. They usually love to play around with the props. Such a great design! These are so perfect!! I love photobooths at a party!! It just adds such a fun activity! Photo booths are so fun!! What a festive way to celebrate and make memories for the new year!! I love having some props around at my parties, always makes for some fun photos! This is an amazing photobooth prop set! 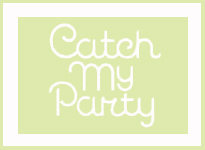 Totally pinning to keep this in mind for parties! My favorite is “What year is it again?” HAHA! Totally me. All of these props look so fun!! They’d make a great addition to any New Year’s party! 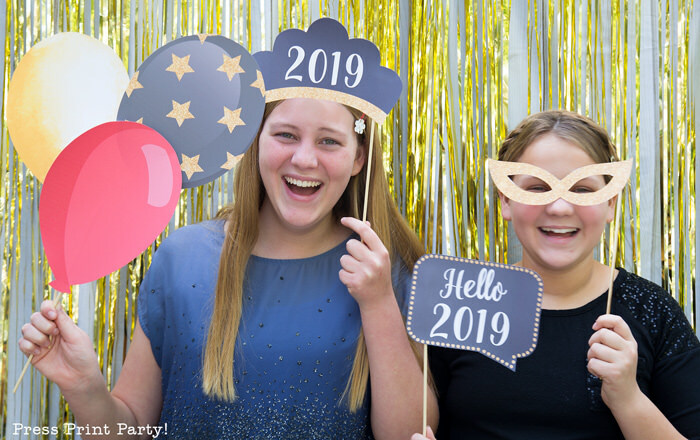 We always love doing photo booths at our parties! These props would be so cute for a Christmas party!! I have pinned this idea to use for later. Thanks!